Before we proceed, why the concepts of Information are needed to define a Theory of Everything? There are two reasons for this: (1) Quantum Physics stated that Reality must be observed by an Observer. (2) To avoid the never-ending answers to the questions on how the Universe began. The former involves with understanding of how information processed by an Observer. The second has to do with Cosmology, in this case, the Paradigm proposed a beginning that points to sets of Logic-Information inputted by God. 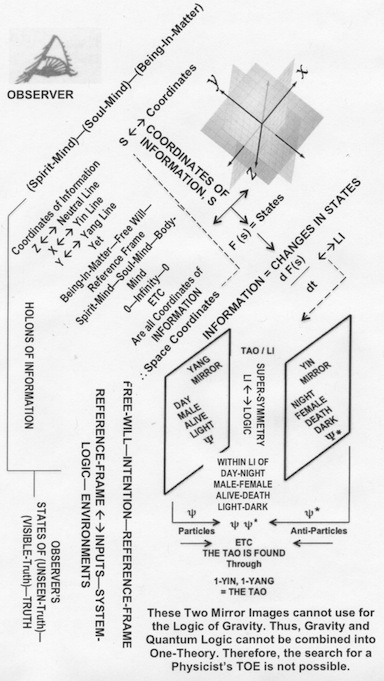 FORMULA-27’s Definition of Information: The two Diagrams below are the Author’s definition of Information from the point of the Mind-Matter Paradigm and based on understanding Formula-27. As the reader can see, this diagram is fairly complicated with many key terms and concepts. 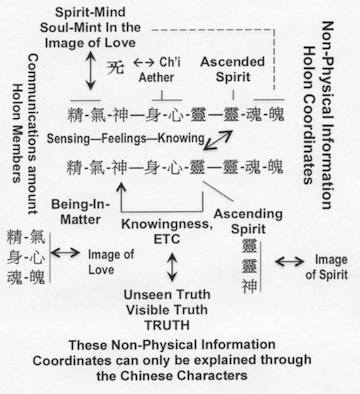 Some of these terms and concepts are foreign to most because it is based on understanding the ancient’s philosophical view and modern sciences, such as the I-Ching, Gnostic, and Quantum-Relativistic Physics. To completely define Information, these terms and concepts are illustrated by diagrams. Some of the these are the Holons: (1) The Mirrors ( —> Space, Super-Symmetry, and Symmetry). (2) State that defines the Coordinates of Information ( —> Concepts embedded in Open System’s Theory, as shown in the bottom diagram defined as F(s) and with its derivative). (3) The concepts of Truth ( —> Meta-Cube defined in both I-Ching Logic and Gnostic Logic, and with a similar view hidden in the Bible ). Information is generated inside the System, as a function of the system’s Coordinates and the system’s outputs; namely the functional Holon of Inputs—Geometry of the System—Outputs. This is what the Observer “perceived” within the Observer’s Feedback process in activating the Holon of Mind—Soul—Spirit. Notice, any observed interactions can be treated as an open system to a Black Box. In the mix of these operations, the Observer’s Holons of (1) Being-In-Matter—Soul-Mind—Spirit-Mind for both Observer-Observed; (2) Free-Will—Intention (executed Feedbacks)—Reference Frame (interacting with the system’s geometry and environments) for both Observer-Observed; namely the Holons activities of (Being-In-Matter—Soul-Mind—Spirit-Mind) <—-> (Ascending-Mind—Ascending Soul—Ascended Spirit) … ( or any combinations with itself and others, see diagram below). (3) Unseen truth—Visible truth—TRUTH embedded in the Li (or the Logic) of F(s) are all involved in the make-up of the observer’s perceived or not perceived Information. 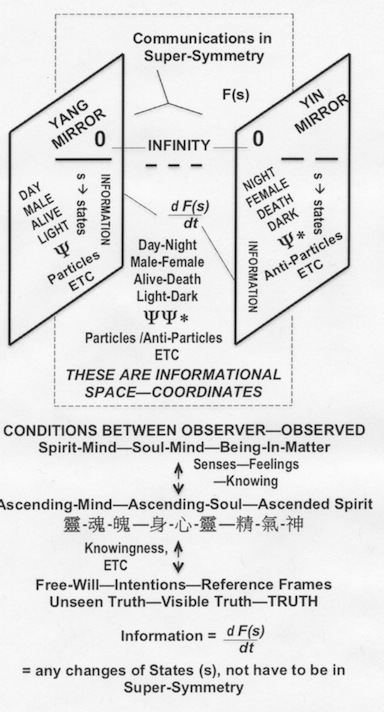 Here, open system concepts are used to describe communications between or amongst any Observer-Observed interactions or interactions among one’s own Mind-Soul-Spirit and/or Being-In-Matter. That is, system concepts are analytical ways of describing these internal feeling sensations. It may be the only way. 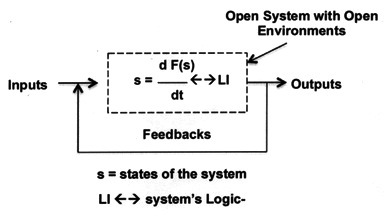 Diagrams (using communication flows, arrows with feed-backs, and triangles as systems) are also part of the open system methodologies. Remember, these are local—non-local—holistic communications. Furthermore, these are communications at the moment of NOW within the Holon of 0—Infinity—0. Next, we shell illustrate in the next 6-Supporting diagrams some of the details given, with illustrations, as expressed in the above two definition diagrams. FIRST, LET US LOOK AT THE PARADIGM’S DEFINITION CONNECTED TO AN OBSERVER-OBSERVED COMMUNICATION. The Observer begins with the Logic encoded in Holon of BEING-IN-MATTER—SOUL-MIND—SPIRIT-MIND. It then evolved to a Holon of ASCENDING-MIND—ASCENDING-SOUL—ASCENDED-SPIRIT in series of Karmic cycles. This evolving states could be one individual (and can also be the Universe) or a group. The Evolution is shown in the above diagram. Thus, the first Observer is GOD and HIS Observation Created the Reality in the form of Inputs, as shown below. These sets of 5-Element generated the Unseen Truth—Visible Truth—TRUTH in Observations. Namely, the Visible and Unseen Truth in the Holon logic of 10 Celestial Stems—5-Elements—12 Terrestrial Branches. 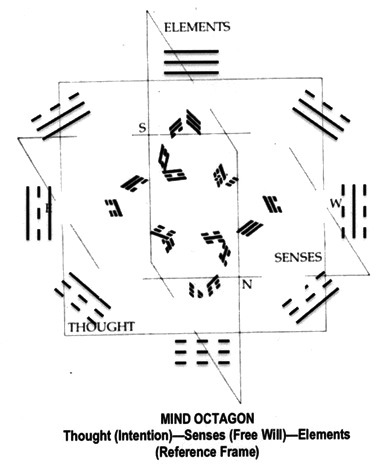 Below, the Holon #27—#37—#64 is generated from both 2-dimensional I-Ching Logic and from the 3-dimensional Meta-Cube Gnostic Logic. 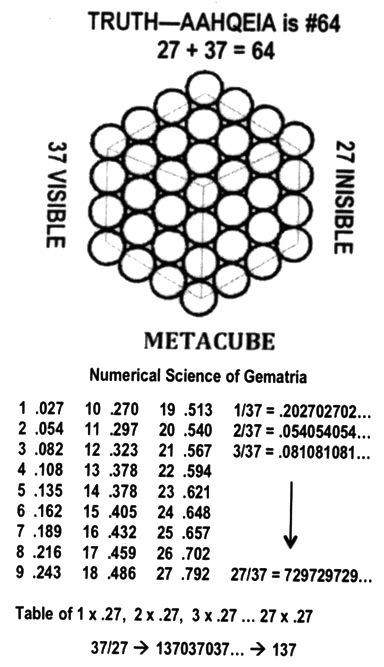 Within the Meta-Cube, the Fine Structure Constant 137 is also formed and with Phi, all other physical constants were derived. These constants created the Find Turned Universe through precise Logic—Information—Energy in two Big Bangs designed by and within God’s Involution Logic, HIS Inputs. Further, as part of GOD’s inputs is to give Free-Wills to all HIS creations for continuing to maintain this Find Turned set of Logic. 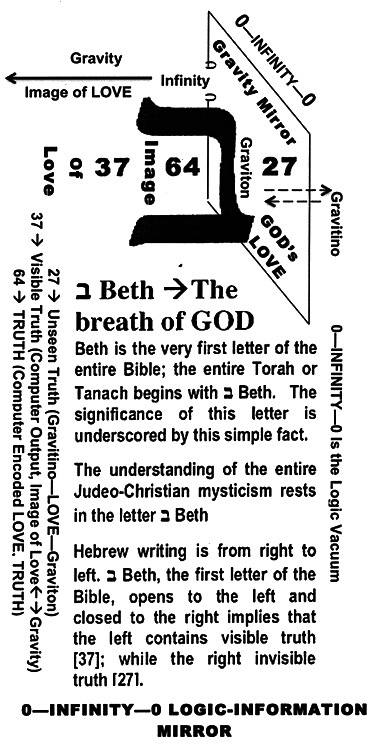 This unseen and visible part of GOD’s Creation is also hidden in the Bible, as shown below in Support Diagram #4. 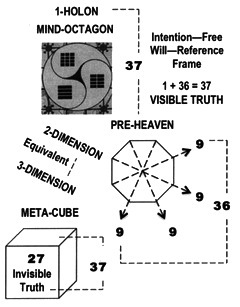 The Sacred Geometry (or the Phi function) is illustrated in the Logic Coordinates of Pre-Heaven—Post-Heaven—Mind Octagons, as shown below, in Diagrams 5 and 6. 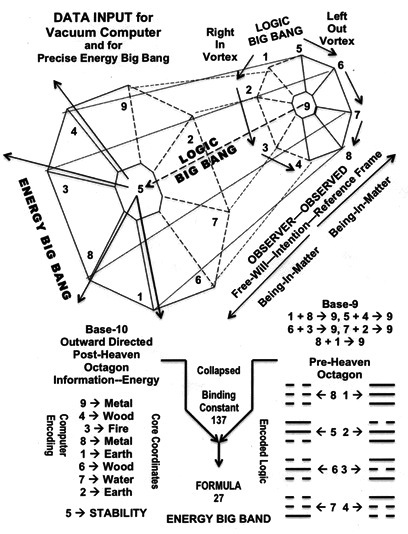 In conclusion, embedded in the definition of Information and shown in these diagrams are the Logic Big Bang, the Energy Big Bang, the concept of Super-Symmetry and their coordinates. 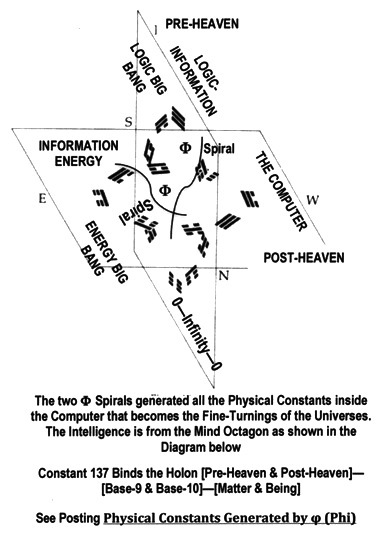 The open system methodology used in describing this Mind-Being Paradigm is simmular to the computer language used by the programers. 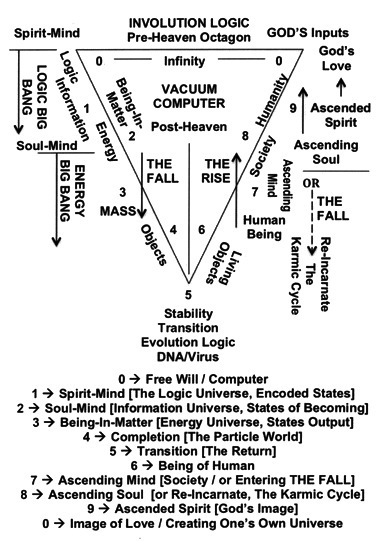 Thus, using this methodology to describe the contents hidden within God’s Vacuum Computer is very natural, at least for this Author. The details of all 6 Supporting Diagrams are in the previous 11 Postings on Formula-27.